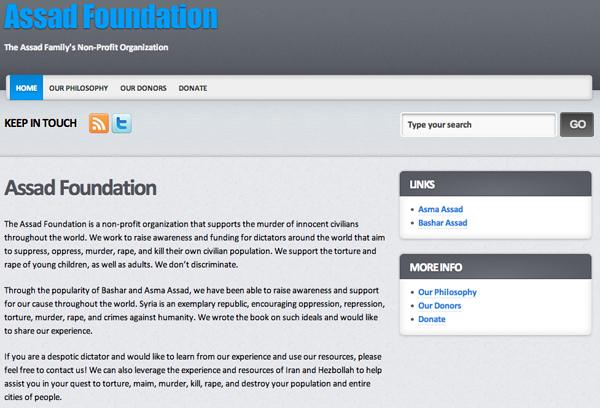 As the Syrian regime continued its brutal suppression of the revolution, while publicly denying such violent actions, anonymous activists launched the Assad Foundation, a spoof website for the Assad family's non-profit organization “that supports the murder of innocent civilians,” according to the website. Using fake ironic pages that put a twist on official messages, the website blatantly mocks and exposes the regime and its supporters. It also includes links to parodic profiles of President Bashar al-Assad, who describes himself in the page as “a vicious war criminal” and “butcher,” and his wife Asma, “the Western-educated, progressive, fashionable, philanthropic, desert rose,” who stands by her man.